Cook, F.r.. "Reptile". The Canadian Encyclopedia, 04 March 2015, Historica Canada. https://www.thecanadianencyclopedia.ca/en/article/reptile. Accessed 22 April 2019. Reptiles are a group of vertebrate animals that, like mammals, produce an amniote egg, with extra-embryonic sacs for waste, yolk, and protection, and often possessing a shell, particularly if released by the female before development of the embryo is completed. 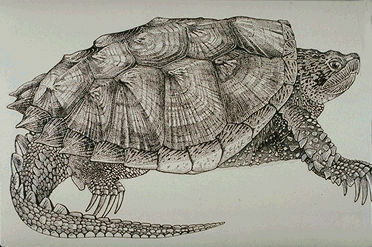 Snapping turtle (artwork by Charles Douglas). 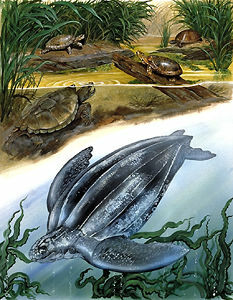 Pacific pond turtle (top left), stinkpot (top right), snapping (left), western painted (right) and leatherback (bottom) (artwork by Jan Sovak, 1989). 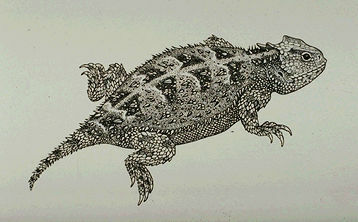 Pigmy horned lizard (artwork by Charles Douglas). Reptiles are a group of vertebrate animals that, like mammals, produce an amniote egg, with extra-embryonic sacs for waste, yolk, and protection, and often possessing a shell, particularly if released by the female before development of the embryo is completed. DNA analysis has allowed comparison of the genes in common for living organisms and new fossils have augmented our knowledge of the sequence of appearance of many features. Combined, these lines of research have produced changes from classical classification in which birds were regarded as most closely related to mammals primarily because they are both endothermic (able to maintain an internal body temperature). Now it is believed that each evolved this feature independently and that birds are derived from dinosaurs. Today's reptiles represent 2 main lines: Parareptilia or Chelonia (turtles) and Eureptilia or Diapsida, which contains the Lepidosauria (Tuatara, lizards and snakes) and Archosuria (crocodilians and birds). Reptiles are primarily tetrapods (4-legged), but legs are not found in snakes and some lizards, eg, most amphisbaenians. Epidermal scales cover the outside skin, providing protection from injury and drying (and, in the case of birds, providing insulation to retain body heat). Dermal scales (in the underlayer of skin) are best developed in turtles, fusing to each other and to the ribs dorsally to form the shell. Crocodilians, tuataras and some lizards also have dermal scales. Epidermal scales are also variously modified to form the horns of the horned lizard, the rattles of rattlesnakes and the feathers of birds. Modern reptiles, exclusive of the birds, are mainly relatively small, active forms. The largest, the marine leatherback turtle, may weigh up to 680 kg. Reptiles have lungs, never gills. Some turtles can supplement their oxygen supply through pharyngeal breathing to stay underwater for extended periods. The reptile heart is 3-chambered, except in crocodilians and birds, which have a 4-chambered heart. Skin glands are almost entirely missing, but many reptiles excrete a foul musk for protection, or more pleasantly scented secretions for sexual attraction. One group of lizards and several groups of snakes have labial poison glands in the upper jaw. The key to reptile success in invading the land was the amniote egg with a protective shell and embryonic membranes. The shell is permeable, so it must have some environmental moisture, but it is much more resistant to desiccation than the amphibian egg. Eggs are usually buried in loose soil or sand, or deposited in rotting vegetation. Crocodilians, tuataras and some lizards also have dermal scales. Tuatarans, crocodilians, turtles and birds lay eggs. Many lizards and snakes do too, but some females retain the embryos within their bodies. Like mammals, the young in these cases are born only after their development is complete; however, unlike mammals, they receive little or no nourishment from their mother during development. Like amphibians, reptiles (exclusive of the birds) are ectothermic, eg, they have a relatively low metabolic rate and depend largely on external heat to attain the temperature at which they function best. (Birds are endothermic; they are able to maintain an internal temperature). Most reptiles maintain preferred temperatures by alternately basking and seeking shelter. Although reptiles are most abundant in the tropics, turtles, snakes and lizards are fairly successful in temperate climates. By dormancy in cold months they avoid having to eat just to maintain their body temperature and can use proportionally more food energy for growth and reproduction when conditions are warm. Today, reptiles (exclusive of birds, which have 9700 living species) are not as diverse as in the Mesozoic (253-65 million years ago), but the dominant modern group, the squamata, is very successful. There are more than 4450 species of lizards (135 of them amphisbaenians), 2900 snakes, 285 turtles, 23 crocodilians and 2 tuataras. Lizards, snakes and turtles have worldwide distribution in both tropical and temperate areas. Crocodilians are largely tropical although they invade the fringes of the temperate zone. In Canada 43 non-bird species are native: 13 turtles (5 marine), 5 lizards and 25 snakes. Three additional turtles and one lizard have been introduced. Southwestern Ontario and the grassland valleys of southern BC have most species. No reptiles occur on the tundra and few species in the boreal forest. All reptilian natural populations in Canada are postglacial immigrants, which spread northwards over the past 10 000 years. The common garter snake, the most northerly ranging species, reaches Fort Smith, NWT, and the southern coast of James Bay. In general, reptiles are not economically important in Canada, except as predators, such as the rodent-consuming snakes. Turtles were sometimes trapped and sold as food, mainly in the East, most apparently going to US markets, but conservation laws now protect most populations. Garter snakes were collected, particularly in Manitoba, for sale to universities for laboratory dissection. Fatal bites from rattlesnakes are rare and Canada's 3 restricted existing species and one exterminated one have not represented a particularly significant hazard to people or livestock, though there have been occasional deaths recorded. F.R. Cook, An Introduction to Canadian Amphibians and Reptiles (1984); T.R. 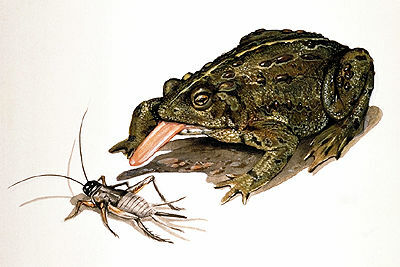 Halliday and K. Adler, The Encyclopedia of Reptiles and Amphibians (1986); F.H. Pough, J.F. Cadle, R.M. Andrews, eds, and M.L. Crump, A.H. Savitzky and K.D. Wells, Herpetology, 3rd edition (2004); C.N.L. Seburn and C.A. Bishop, eds, Ecology, Conservation and Status of Reptiles in Canada (2007); G.R. Zug, L.J.Vitt, and J.P. Caldwell, Herpetology: An Introductory Biology of Amphibians and Reptiles, 2nd edition (2001).